This was a very interesting project to do, and one which I thoroughly enjoyed. A woman wanted a painting of a pomegranate orchard to give to a loved one for a Christmas present. The man had grown up in a middle eastern country where such groves were common, and he had childhood memories of playing there. I had never painted in that country, nor did I have any usable reference material, but I did a little research and realized that the area had a mediterranean climate and that the geography looked much like parts of California. So, I used a late afternoon photograph of a grove in California and used local reference photos of pomegranate trees to create an imaginary composite, which I showed her for her approval. So, this was the result, and I understand that her friend was very happy with the result. We all love to paint from real life whenever we can. But this is one of the occasions when it’s just not possible. That’s when we, as artists, draw upon our memory and study of nature, and from having painted so much outdoors that we can craft as scene as it might have been. 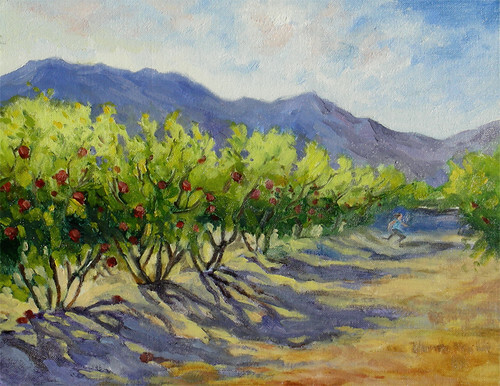 If you’d like to give a special painting to someone commemorating a place or an event, but you don’t have a picture to work from, we can probably come up with a solution, just like this orchard from long ago and far away. What a clever solution! I really like the picture too…you have been showing some gorgeous paintings! I would never have known it was a composite – just that it is beautiful. Very glad it met with a happy recipient! Great job on this painting and your imaginary composition. I do this at times and with proper reference material it is a lot of fun to do. Most times the recipient could care less how you did it. You did it for them and that’s what counts. Your proper use of perspective, shadows along with your talent and workmanship makes this all turn out great. This is a lovely painting. I like the way the shadows mimic the colour of the hills. I did not know that pomegranite groves existed. I’ve only ever seen one tree at a time. Ohhhhh! I love this painting. The legs of the trees, their shadows, the daubs of red, the contrast between the light green tops and dark green undersides . . . are captivating!